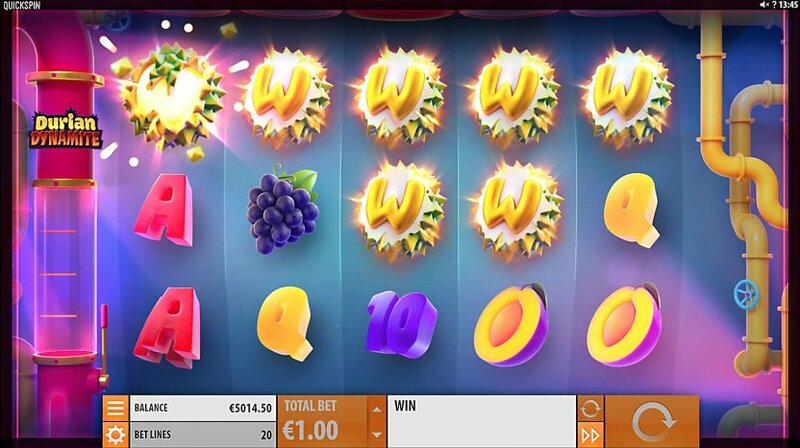 Fans of fruity-themed games will definitely appreciate what Quickspin did with its Durian Dynamite slot. The company behind the game is definitely continuing its tradition of releasing fruity-themed games. As suggested by the game’s title, it is inspired by the world's smelliest fruit and it features a massive fruit explosion. The game comes packed with 5 reels and 20 paylines featuring fast-paced spinning actions and some fruity winnings. The Durian Dynamite is the company’s very first 3D game, so it is much more than a standard fruity-themed game. During their Durian Dynamite gameplay, players get to spin the reels at blasting speeds as well as take advantage of the game’s explosive bonus features. In addition to being packed with bonuses, the game is also neatly rendered packed with top-notch 3D graphical solutions and appealing visuals. The game comes packed with beautifully rendered Durian Dynamite fruity symbols which explode on the reels rewarding players with wild symbols. Looking from an aesthetics point of view, the game looks very bright and colorful. As expected, its reels are packed with various kinds of fruity symbols including cherries, oranges, grapes, watermelons, and plums. There are also standard playing cards depicted in the game which act as its lower-valued symbols. Despite the fact that the game’s theme is rather traditional, its setup is truly modern. The most rewarding symbol is the latter which brings winnings up to 25x players’ stake for five landed symbols. The game’s wilds depicted as durian is also bringing winnings up to 25x players’ stake for five landed symbols. Wilds also come with their usual responsibility of replacing regular symbols on the reels. The main attraction of the game is its Dynamite Wild bonus feature which is triggered once dynamite wilds hit the reels. Once triggered, players get to shot smelly durian fruits so that dynamite wilds explode possibly triggering chain reactions. The game is also packed with its free spins mode. This mode is triggered by landing three or more of the game’s scatter symbols. Before this bonus mode starts, players are taken to the game’s Bonus Picker screen where they can uncover up to 30 free spins, the Durian Ammo modifier packed with two extra durians active during the Dynamite Wild mode or the Dynamite Reels active during the game’s bonus mode. The game is a high volatility slot with an RTP of around 96.22%, bets between 0.20 and 100 coins per spin and maximum winnings up to 2.515x players’ stake.